AMIE exams are conducted by The Institution of Engineers. AMIE(I) Study Circle provides AMIE admission package (with admission process and AMIE application form) and AMIE coaching material to AMIE aspirants from all over India and abroad engaged in engineering field. There is nice online support too, which includes course updates, unsolved papers, iQuiz, eBooks and video lectures. To bring total quality in this AMIE course for AMIE aspirants, we are using kaizen strategy(continuous improvement) in the process of course development. You can enroll at any time (as the despatch schedule is adjustable). However you are advised to join as early as possible, because it will give you more time for study and revision of the course material. Well, we cover entire AMIE syllabus as prescribed by IEI, Kolkata. The entire printed course material in the form of notes is divided into number of modules consisting of basic concepts and examples to bring out clarity. At the end of the module, number of problems are given in assignment sheets. Objective type questions (compulsory@20 marks) are also incorporated at the end of assignment sheet. The course is updated regularly, and additional material/upgrade is always available on our website. No text book / solved paper study is required with our course. To bring total quality in the course, we are using kaizen strategy(continuous improvement) in the process of course development. However, we skip those topics which have not been asked for a long long time. Such topics are unimportant and waste precious time of AMIE aspirants. To further strengthen our AMIE course, we are giving online support which includes AMIE question papers, model papers, online objective questions, video lectures, audio lectures, eBooks and coure updates. 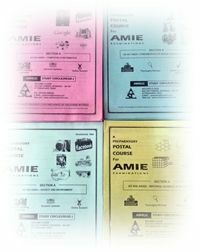 Why Should I Join Your AMIE Postal Course? Why Not Book? Well, this a very interesting question. You know, generally a book covers syllabus of all the engineering colleges in India to augment the sale of the book. In other words, books are not focused according to AMIE Examinations. So you have to put extra efforts to make notes from the book so as to make it useful for your purpose. In this process you waste your precious time. Novelty of our course is that it is focused. Focused on AMIE Examinations. And we stay focused on it. We do not chase any other area. That is why our postal course is better than books as far as AMIE examinations are concerned. Would I Face Any Difficulty Studying Your AMIE Postal Course By Myself? This is a self study course. And so this course is meant for those AMIE aspirants who are willing to study on their own - without being instructed by someone else. And our study materials make this quite easy to do. It is almost impossible that you face any difficulty understanding any topic. lessons do not use language that is unclear or confusing. Notes are written in simple English, easy to understand. They convey ideas from instructor’s mind to your mind quickly, easily and accurately topics of the lessons are well planned and well organized lessons do not tell you things in a hurry or leave you wondering what they mean. the lessons anticipate the sort of difficulties you may run into while learning from them, and sort of queries and questions you may like to get answered. The lessons deal with these difficulties, and answer all these queries and questions thoroughly and completely.